In 2016 I released my book Dr Ripper’s Fabricated Freaks which is a selection of 13 adult humour horror stories written in verse. Despite me pushing the boundaries of good taste they seemed to go down well. The experience was also so fun as I drew the illustrations (of which there were many) live on Periscope. 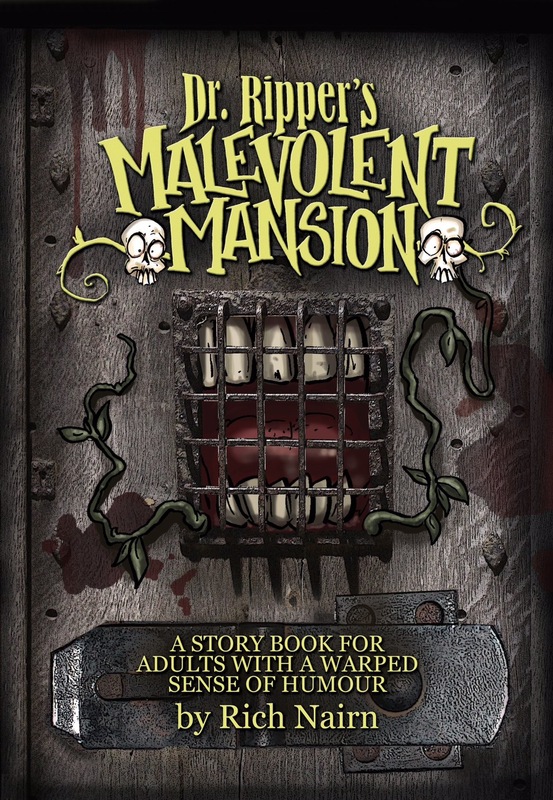 So I began work on another, once again loosely based on friends of mine and set in a household called Malevolence Mansion, each tale telling a story of how the staff members came to be there. Today I’m pleased to announce that book has been released! Dr Ripper’s Malevolent Mansion is available on Amazon in most countries and I will also soon be selling signed copies from my site. Email richnairn@hotmail.com for details. Hiring a fun casino is an entertainment service for you and your guests. When your guests arrive, A K Casino Knights will supply everyone with fun casino money and your guests can exchange them at the tables to play for a prize, or for bragging rights! About 6 months into its life I discovered the wonder that is Periscope, an app that allows the user to broadcast live footage of whatever they do to the wide world. I’d always loved using twitter as it could get me in touch with a much wider audience than before. My Random Doodle Time cartoons proved to be a fun little gimmick where people could suggest cartoons for me to draw and of course the aspect of sending celebrities cartoons was a great feature. But Periscope was something brand new. My twitter friends Frank and Amy (@TheDaftPrawns on Periscope) brought the app to my attention and it opened up a whole new world to me, literally. All of a sudden I had at my hands a tool where I could draw in the Doodle Cave while chatting to people all over the world. Dr Ripper’s Fabricated Freaks was almost completely created on Periscope and the following books will be too. Periscope also got me in touch with some great scopers from across the water, @marty888nyc and @MaryNYC1 giving wonderful tours of New York, the hilarious Doug & Ally from @FrameableFaces with their morning show from their studio. There’s also @Claesgens scoping for Floscopetv, a mellow and refreshing show from the beaches of Florida. It’s also a great place for watching creative peeps, @serensketches creating awesome illustrations that she sells, @karensilbergceramics, a potter creating an amazing selection of products, all the while having fun with her audience. These are just a few but there’s a whole world out there to discover and I highly recommend it. Yeah, there’s Facebook Live and Busker but in my opinion they don’t really come close. 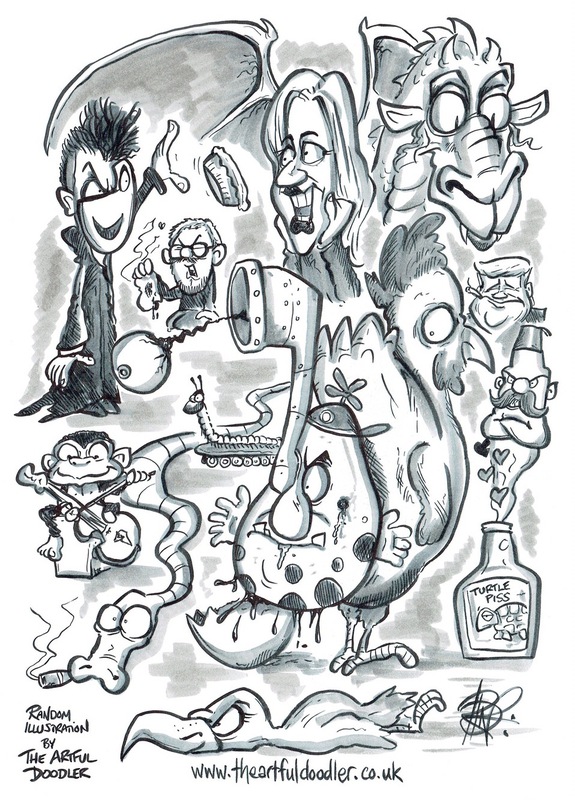 To celebrate yesterday’s two year anniversary I scoped an illustration that people could suggest ideas for.. the result was a strange collection of weirdness. You can now buy the original here. 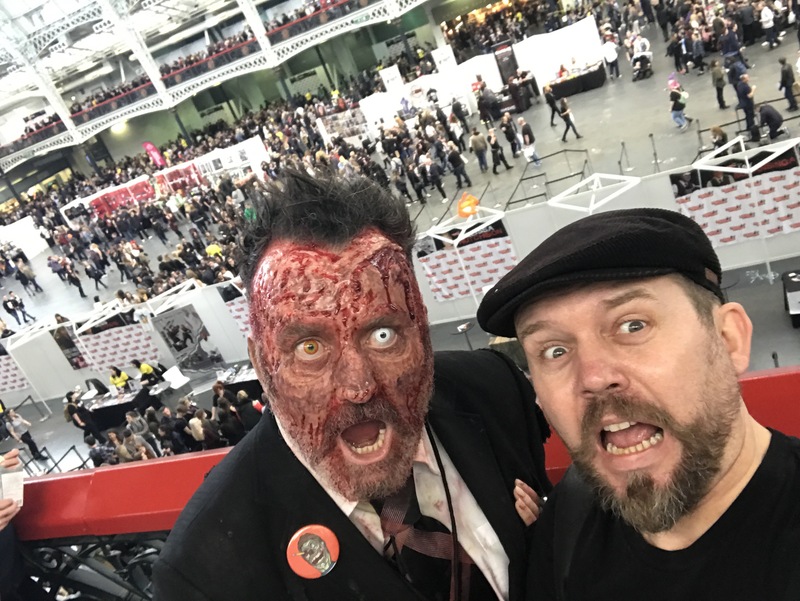 You can also watch the whole bizarre creation on the link below, just watch out for the odd bit of bad language..
A couple of weekends back I had the pleasure of attending Walker Stalker Con, a convention dedicated to The Walking Dead. I had attended last year and had been pleasantly surprised by what a great event it was, despite hearing about queues and all sorts of horror stories. But that’s the way of a convention, to meet the stars you have to queue and that’s the way of it. 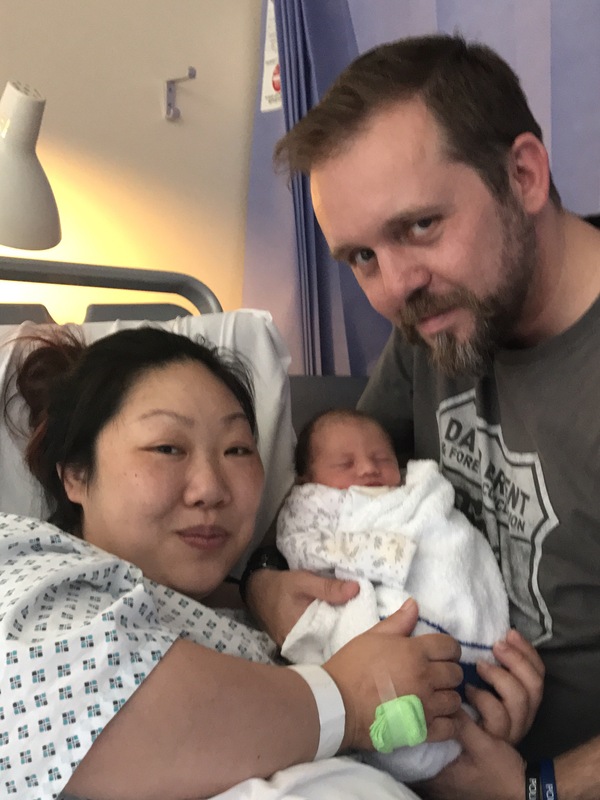 This year we drove all the way as I didn’t want my heavily pregnant wife struggling with the underground, and we parked at Olympia’s ample parking. Once inside we were greeted with all sorts of gory and bloody stalls featuring Walking Dead merchandise, one doing zombie makeup, another to my surprise doing zombie tattoos. There were also people dressed as the undead staggering around scaring the visitors and you’d hear screams coming from all directions. At one point to my wife’s disbelief, I actually recognised one of these undead people, a friend of mine who runs a zombie training school called Zombie Business. 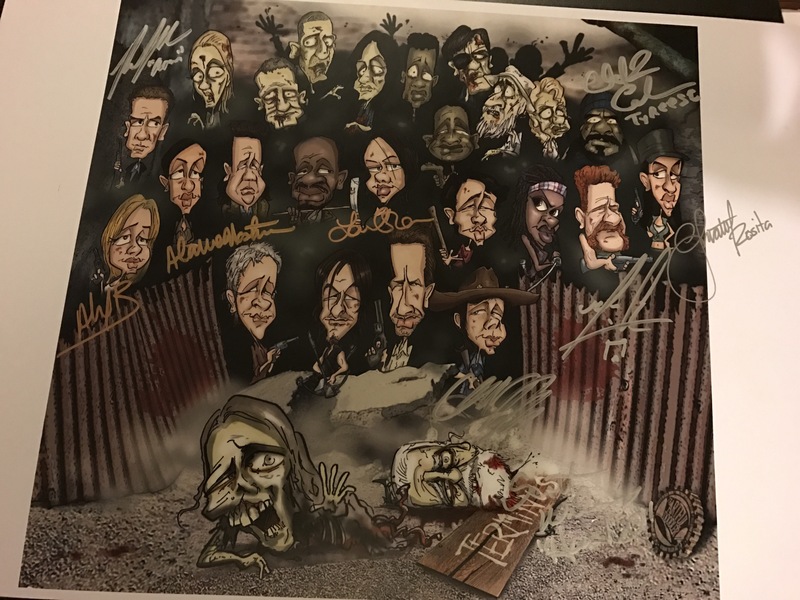 Felt bad that he had to break character momentarily to say hello..
My main reason for visiting all this hideousness is to meet the celebrities and give them a copy of my Walking Dead artwork. First up was Scott Wilson, the actor who plays Hershel in the series. A really nice guy. After saying hello and getting him to sign my copy we wanderered off to find him chasing us to get my contact details, hopefully not in order to sue me for drawing him as a disembodied head laying on the floor. 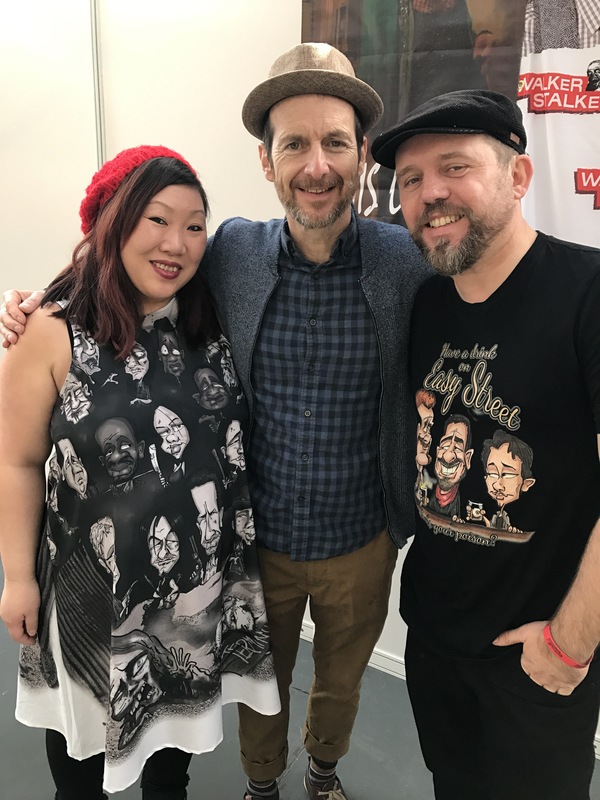 We followed up with meeting Denis O’Hare, star of the brilliant American Horror Story. I’ll admit I was a little sick I didn’t know he was there, always nice to give stars a caricature. Maybe he’ll return and I can get one created in time. Meeting him made my wife’s day..
Incidentally the tshirt/dress we were wearing above got a lot of interest from our fellow attendees which was nice, made sure I gave these people the link to my Redbubble store… always the businessman, in the nicest possible way of course. 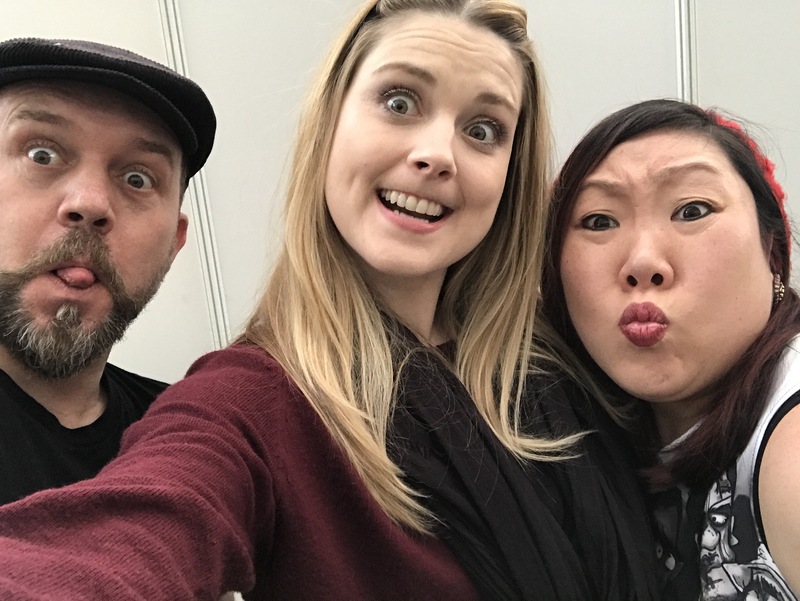 Also on the list of Walking Dead stars we got the chance to say hello to were the stunning Alexandra Breckenridge (who is something of a selfie master) the lovely Lauren Cohan and the awesome Christian Serratos who took a long time to chat with us and after a chat with her partner said she’d be putting my caricature up in her games room. Music to a caricaturist’s ears. We did intend to meet up with Michael Cudlitz who we had met last year and found him a real pleasure to chat to. I was going to give him a copy of my latest design (above) but after queuing for around two hours I decided it best to take the pregnant one home. Fanboying can only go so far. I did hear he stayed til the very end to meet his fans to which I tip my cap to him, that’s gotta be a seriously exhausting day. All in all a fun day had. If you’re a fan of The Walking Dead you really must make a visit.. just start putting money in the zombie piggy bank in preparation. If lots of your family members are meeting for the first time, the casino games are a great way to break the ice, become a team and BEAT THE DEALER! Everyone, old and young get to play the games, offer advice to each other and have lots of fun doing it! Ah Whitstable. I love Whitstable, one of those quaint little sleepy seaside towns with lots of little curiosity shops and restaurants. This town also has one awesome claim to fame, it was home to the legendary Peter Cushing, star of the awesome Hammer horror films and a true gentleman. Being a gentleman isn’t a rarity in Whitstable. It strikes me as a place full of gentle and friendly people and this was certainly the case on Sunday when we had a stall at the East Quay Venue, overlooking the beach. As usual I had my lovely wife Mai along to help me, now almost 5 months pregnant and truly showing. 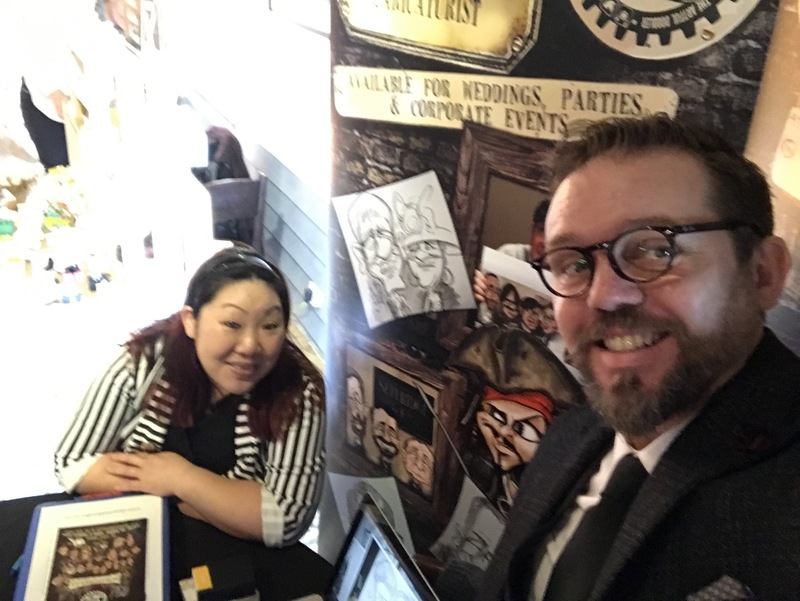 This didn’t stop her, she explained to the guests how the doodles work at weddings while I got to draw some lovely peeps. It’s really nice getting to meet all these brides and grooms to be and such an honour to think they may have me as entertainment on their big day. 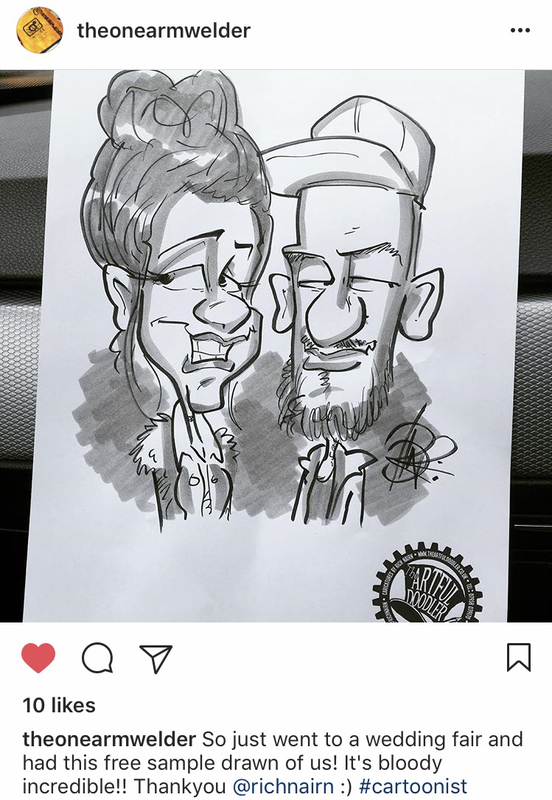 Nice too to get positive responses from people regarding the doodles drawn at fairs, as I did with this one posted to Instagram about an hour after drawing it..
Now as much as all these things are great at wedding fairs, East Quay has a little trick up their sleeves that gets all the wedding suppliers twitchy at around 1.30. 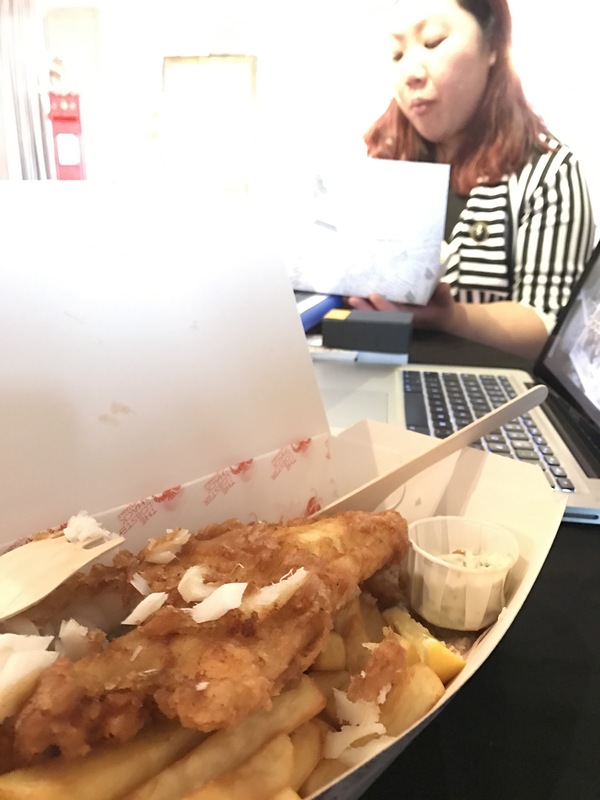 For this is the time we all get a portion of fish n chips, and I can safely say it’s some of the best I’ve tasted. Luckily for some reason no guests seemed to walk past but maybe I just didn’t notice with my head stuck inside the box.. The venue itself is a delight, a clean and bright wooden building with a definite seaside feel, plus very roomy too. Check out their website at East Quay Venue. As always thanks to all who came and got a doodle, special thanks to those that booked and I look forward to receiving further enquiries following that great afternoon at the seaside! My mum has always said this to me and I know what she’s saying in her kind and careful way. I’m a grumpy little sod. Well I can be, I’ll admit it. Having a creative side can also give way to an inner rage when things go wrong. I’m not often prone to public displays of fury but save that for shouting at my laptop or printer when they are slow, which is generally relocated anger from someone shouting at me earlier that day. Sometimes, and I’ll use these last few weeks as a case in point, the world seems to be putting a succession of petty little mini roadblocks in my way which culminate in me walking around like a bomb waiting to go off. 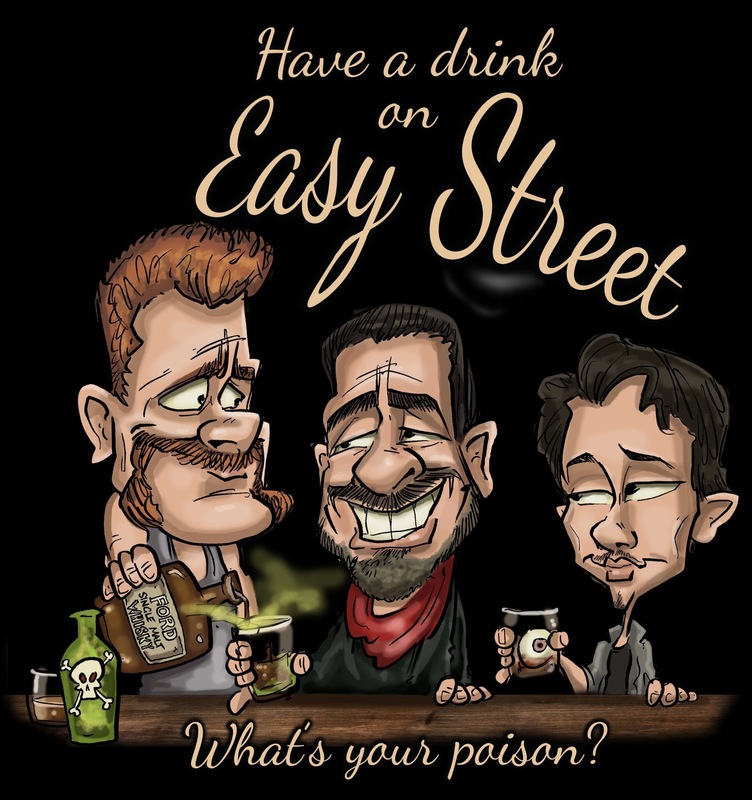 A few unruly customers here, problems with copyright on my artwork there.. you’ve only got to read my last few blog posts to see that slowly my fuse was being lit and I was getting close to exploding. 1. Go all-out Michael Douglas in Falling Down, grab a rocket launcher and attack some drug dealers. 2. Read the Abide Guide. Option 1 is ok but a bit messy. Plus I don’t have a rocket launcher and am not entirely sure where you find drug dealers in Kent. Boots chemists maybe? 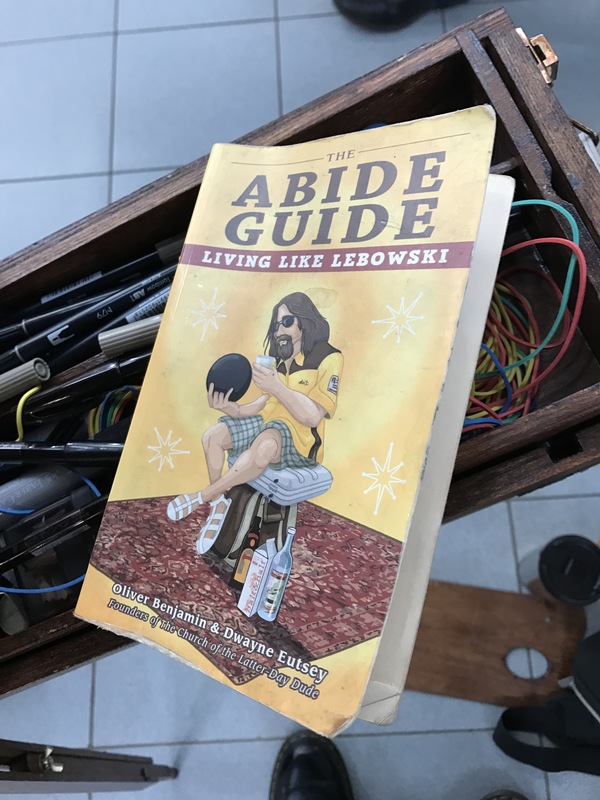 The Abide Guide is a book written by Oliver Benjamin and Dwayne Eutsey and is one of many created for Dudeism, a religion that certainly doesn’t take itself seriously; something all other religions should think about. All the best things in life are those created with humour in mind. Dudeism is a belief system invented by Oliver Benjamin and is based on living your life in the style of The Dude from The Big Lebowski. So generally taking it easy, not worrying about the future and accepting others for the way they are. Nothing wrong with that. Plus they support getting drunk, taking long baths and bowling which are some of my favourite things. My Abide Guide is now like a worn out old sock, as it’s been read and re-read in those times when the world feels like it’s spinning out of control.. and boy does it work. 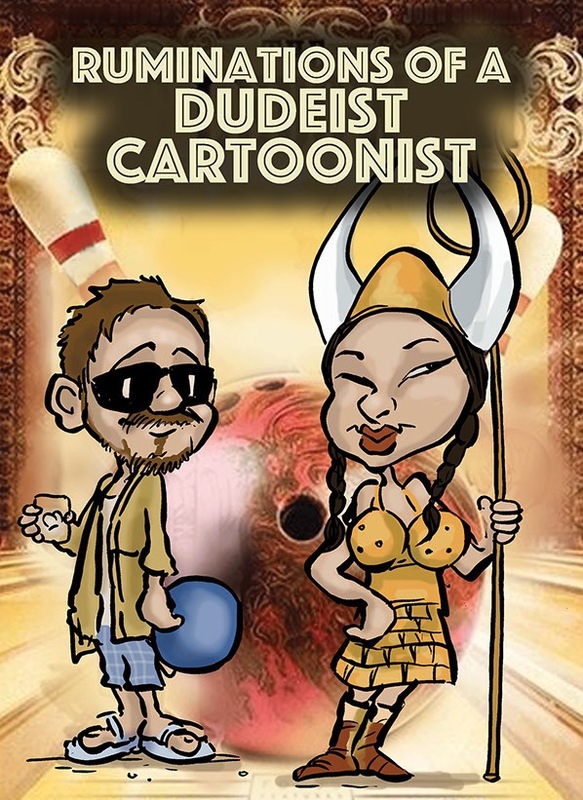 This has given way to me producing my little Ruminations of a Dudeist Cartoonist cartoon strips. So for now I’m channeling that inner dude in defence against petty woes. Not seen The Big Lebowski and/or Pulp Fiction this this won’t make one bit of sense but for those that have maybe you’d like to check out Dudeism, it really ties the room together.